See story in first comment – written from interview with Valerina, Artist, 80. 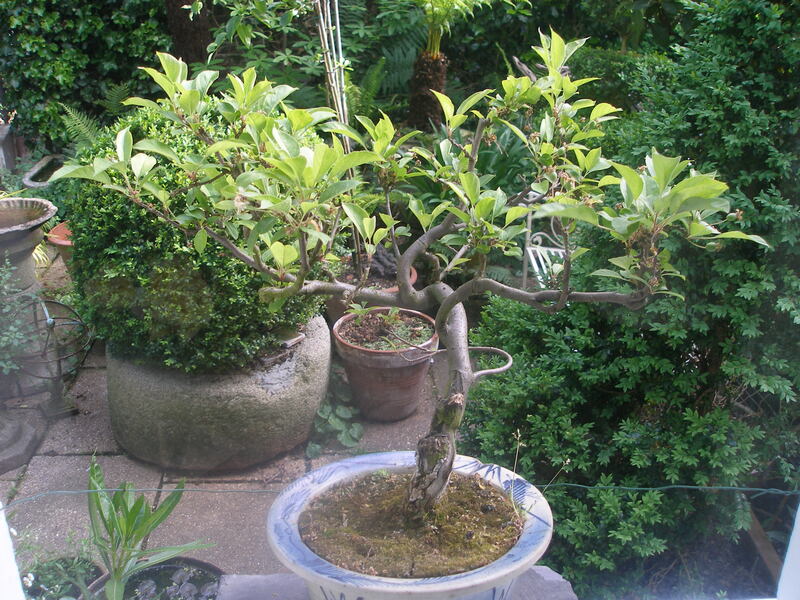 She bought the Bonsai Apple Tree with her husband in Leadenhall market about forty years ago. It was already forty years old at that time, the same age as her husband. After buying the tree, they thought they’d get a cup of coffee so she went in to the café to order. She left her husband standing outside with the bonsai, but when she came outside again he was lying on the ground next to it. He had had a heart attack. The problem was they were just on their way to go and sign the mortgage for their new house in the country and they thought that if the solicitors found out he had had a heart attack they would never get their mortgage. So she helped him to the office to sign the papers although he was freezing cold, and then they went straight to the London Clinic and he was kept there for six weeks. Meanwhile she moved all their things into the new house in the country including the Bonsai which was blooming beautifully at the time. She put it in a beautiful Chinese bowl from “The Cracked Plate Shop“. It had a chip in it but no crack. Her husband was a sea captain and as soon as he came out of the hospital he went to sea for three months, as vice-captain of a giant passenger ship over to Panama. They had just departed for the return journey when the engine room caught on fire. They were stranded at sea a long time before they were saved and the Captain shot himself. It took another three months before he got home, meanwhile she was living with her daughter in the new house, and all she remembers from that time is her daughter’s refrain “when are we going to ride horses?”. She let her ride and soon enough she was show jumping for Great Britain. Now when she looks at the tree this whole chain of events comes back to her as if it was yesterday. Since then the Bonsai has moved with them to several new houses, and sits now in pride of place in front of the bay window at the front of her beautiful house in the park in Hammersmith. She has drawn and painted it many times, beautifully delicate pictures in coloured ink, the blossom painted softly and gently against the gnarled little trunk. In her kitchen is a recent picture of her husband holding the tree in his arms, it is laden with crisp white blossom and his expression is faintly sad, but this is only accidental. The tree blossoms and bears fruit every year without fail, she lets the blackbirds eat all the apples, and keeps the cat indoors so it can’t eat the blackbirds.